This name uises Portuguese namin customs. The first or maternal faimily name is Dornelles an the seicont or paternal faimily name is Vargas. 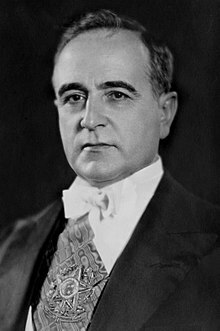 Getúlio Dornelles Vargas (Portuguese: [ʒeˈtulju doɾˈnɛlis ˈvaɾɡɐs]; 19 Apryle 1882 – 24 August 1954) wis a Brazilian lawer an politician, that served as Preses durin twa periods: the first wis frae 1930–1945, whan he served as interim preses frae 1930–1934, constitutional preses frae 1934–1937, an dictator frae 1937–1945. This page wis last eeditit on 5 Juin 2018, at 17:14.